Park, J., Jeong, N. (2016). Corrosion Inhibition Effect of Ester Containing Cationic Gemini Surfactants on Low Carbon Steel. Iranian Journal of Chemistry and Chemical Engineering (IJCCE), 35(1), 85-93. Jong Kwon Park; Noh Hee Jeong. "Corrosion Inhibition Effect of Ester Containing Cationic Gemini Surfactants on Low Carbon Steel". Iranian Journal of Chemistry and Chemical Engineering (IJCCE), 35, 1, 2016, 85-93. Park, J., Jeong, N. (2016). 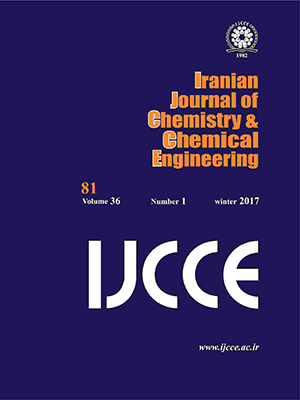 'Corrosion Inhibition Effect of Ester Containing Cationic Gemini Surfactants on Low Carbon Steel', Iranian Journal of Chemistry and Chemical Engineering (IJCCE), 35(1), pp. 85-93. Park, J., Jeong, N. Corrosion Inhibition Effect of Ester Containing Cationic Gemini Surfactants on Low Carbon Steel. Iranian Journal of Chemistry and Chemical Engineering (IJCCE), 2016; 35(1): 85-93.
α, ω-alkane-bis(N-myristoyloxyethyl-N, N-dimethyl)-diammonium bromide were synthesized and confirmed by FT-IR, FT-Raman and 1H-NMR spectroscopy. Surface tensions were measured by sigma 70 and conductivity meter EC-470C. Critical micelle concentration values were 2.70×10-4∼3.05×10-4 mol/L. The Krafft points were measured at 39.1 ~ 43.2℃. Their inhibition effects on the corrosion of low carbon steel were tested by the weight loss method in hydrochloric acid. The corrosion inhibition capacity of synthesized cationic gemini surfactant was 24.8% at 1 X 10-7mol/L concentration. Corrosion inhibition efficiency has increased by 93.8% after the concentration was increased to 1 X 10-4mol/L. As a result, these surfactants are expected to be applied as corrosion inhibitors. Lia R., Yana F., Zhanga J., Xua C., Wangb J., The Self-Assembly Properties of a Series of Polymerizable Cationic Gemini Surfactants: Effect of the Acryloxyl Group, J. of Colloids and Surfaces A, 444 : 276-282 (2014). Ester-Containing Gemini Surfactants: The Surfactant Structure and Salt Effects, J. of Chem. Thermodynamics, 62 : 201-210 (2013). Bhadania A. A., Shresthab R. G., Kouraa S., Endoa T., Sakaia K., Abea M., Sakaia H., Self-Aggregation Properties of New Ester-Based Gemini Surfactants and Their Rheological Behavior in the Presence of Cosurfactant — Monolaurin, J. of Colloids and Surfaces A, 461 : 258-266 (2014). Qiu L. G., Wu Y., Wang Y. M., Jiang X., Synergistic Effect Between Cationic Gemini Surfactant and Chloride Ion for the Corrosion Inhibition of Steel in Sulphuric Acid, Corrosion Science, 50(2) : 576-582 (2008). Hegazya M.A., Abdallahb M., Ahmedb H., Novel Cationic Gemini Surfactants as Corrosion Inhibitors for Carbon steel Pipelines, Corrosion Science, 52(9): 2897-2904 (2010). Bagha A.R.T., Kärnbratta J., Löfrotha J.E., Holmberga K., Cationic Ester-Containing Gemini Surfactants: Determination of Aggregation Numbers by Time-Resolved Fluorescence Quenching, J. Colloid and Inter. Sci., 376 (1) : 126-132 (2012). Han L., Chen H., Luo P., Viscosity Behavior of Cationic Gemini Surfactants with Long Alkyl Chains, Surface Science, 564(1-3) : 141-148 (2004). Zana R., Dimeric (Gemini) Surfactants: Effect of the Spacer Group on the Association Behavior in Aqueous Solution, J. Colloid and Inter. Sci., 248 (2): 203-220 (2002). Weber V., Narayanan T., Mendes E., Schosseler F., Micellar Growth in Salt-Free Aqueous Solutions of A Gemini Cationic Surfactant: Evidence for A Multimodal Population of Aggregates, Langmuir, 19 : 992-1000 (2003). Karabomi S., esselink K., Hibers P.A., Karthauser J., van Os N.M., Zana. R., Simulating the Self-Assembly of Gemini (Dimeric) Surfactants, Science, 266 : 254-256 (1994). Alargova R. G., Kochijashky I. I., Sierra M. L., Kwetkat K., Zana R., Mixed Micellization of Dimeric (Gemini) Surfactants and Conventional Surfactants: II. CMC and Micelle Aggregation Numbers for Various Mixtures, J. Colloid and Inter. Sci., 235 : 119-129 (2001). Camesano T. A., Nagarajan R., Micelle Formation and CMC of Gemini Surfactants: a Thermodynamic Model, J. of Colloids and Surfaces A, 167 : 165-177 (2000). Lai C. C., Chen K. M., Preparation and Surface Activity of Polyoxyethylene-Carboxylated Modified Gemini Surfactants, J. of Colloids and Surfaces A, 320 : 6-10 (2008). Dourna A., Mokhtar A., Niyaz M.M., Electrochemical Effect of Cationic Gemini Surfactant and Halide Salts on Corrosion Inhibition of Low Carbon Steel in Acid Medium, Corrosion Science, 52(3) : 794-800 (2010). Badr E. A., Inhibition Effect of Synthesized Cationic Surfactant on the Corrosion of Carbon Steel in 1 M HCl, J. of Ind.l and Eng. Chem. 20(5): 3361-3366 (2014). Zhanga Z., Zhenga P., Guob Y., Yanga Y., Chena Z., Wanga X., Ana X., Shen W., The Effect of the Spacer Rigidity on the Aggregation Behavior of Two Ester-Containing Gemini Surfactants, J. Colloid and Inter. Sci., 379(1) : 64-71 (2012). Zhang Q., Gao Z., Xu F., Zou X., Adsorption and Corrosion Inhibitive Properties of Gemini Surfactants in the Series of Hexanediyl-1,6-Bis-(Diethyl Alkyl Ammonium Bromide) on Aluminium in Hydrochloric Acid Solution, J. of Colloids and Surfaces A, 380(1-3) : 191-200 (2011).